Aruba is a Dutch Territory located on the outside fringes of the Hurricane belt in Caribbean sea, making it a perfect island/beach getaway during hurricane season between June-November. Hema and I took our trip to this Netherlands territory in Oct of 2012 and the weather was hot and dry. The land is arid with cactuses but has beautiful white sand beaches with turquoise waters like Palm/Eagle Beaches listed in the 7th place of the Trip Advisor’s top beaches of 2013. Aruba is expensive when compared to many places in US as most of the items were imported to the island. 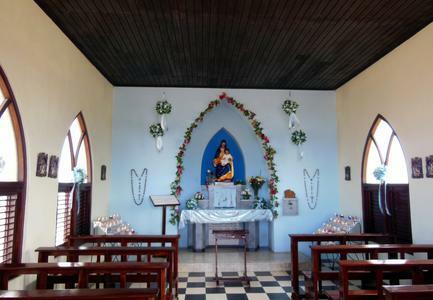 Alto Vista Chapel Built by Spanish missionaries in 1750, services are still conducted in this little yellow chapel that is considered to be the first church established in the Caribbean. We opted to stay in Westin hotel, which is located along with many upscale hotels in the Palm beach and one of the primary shopping districts of the Aruba. 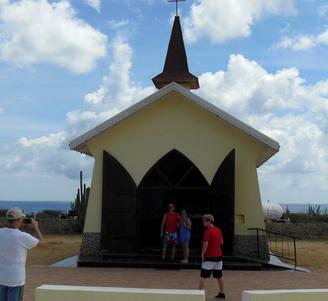 The language spoken in Aruba is Papiamento, primarily a mix of African and Portuguese languages. But most people speak English, Dutch and Spanish. 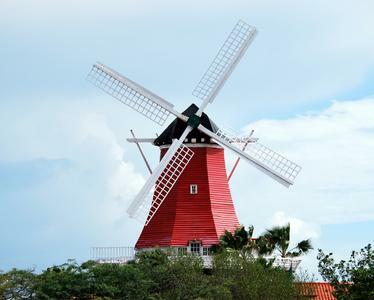 Aruba had couple of gold mills processing gold in the 19th century. Aruba got its name from “Ora Ruba” means “Red Gold”. Shown here is the Bushiribana Gold Mill Ruins. The Gold Mill was shaped in a fortress look-alike to ward off Pirates in these parts. Aruba has several beaches – Most of them are white sand beaches with Turquoise waters. Palm/Eagle beaches are beautiful but more commercialized with evening parties. Baby beach in the southern tip of Aruba is safe for kids. For snorkeling, especially for beginners, I highly recommend Malmok beach, where we were able to spot more than 30 fishes, eels and snakes in 3-5 feet of shallow waters. The tide brings in more water in the late afternoon. For this very reason, the best time to go for snorkeling is during the morning. Take your own snorkel kit as you can park your car on the numerous parking lots and just walk a few feet to snorkel. The Original tourist attraction, Natural Bridge made up of sandstone, collapsed in 2005 due to sea erosion. Shown here is the adjacent baby bridge, which somewhat tries to makeup for the void left by the Natural Bridge. Aruba nightlife is more around the Palm Beach where there are restaurants like Senor Frog’s. Aruba is very safe though the area around San Nicolas needs that extra caution after sunset. As I mentioned above, Aruba can be expensive as the hotels along the Palm beach can cost more than $200 per night. But there are all-inclusive options like Divi Divi resort, which can reduce the cost significantly. A swimmable pool located among rocks. Good place for snorkeling as well. Need a SUV or ATV to drive to this place. Warning – A sedan or smaller cars will not be sufficient to go here. 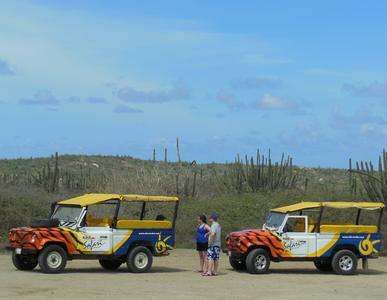 Activities to do include taking up tours (we used ABC tours and would recommend them) to see the above places. 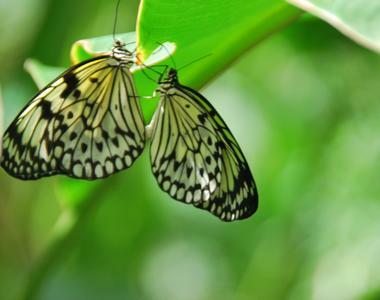 Additionally there is a butterfly garden near Palm beach, where one can spend couple of hours and look at numerous beautiful butterflies and moths. And final piece of advice – rent a SUV as it comes in handy to drive to offbeat places where there are no proper roads. Aruba’s Iconic Divi Divi Tree or Watapana Tree. This Tree is situated on the Eagle Beach and always point to Southwesterly direction due to trade winds blowing from North East. 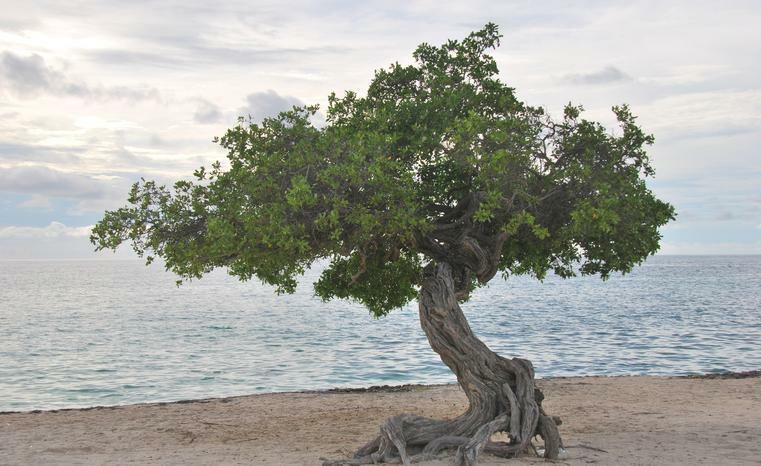 It acts as Aruba’s natural compass.Attempts to plant the tree elsewhere around the world proved futile.